Our favorite party game is all grown up. Telestrations After Dark is the adult version of the #1 LOL party game. Draw what you see then guess what you saw for hilarious, weird, irresponsible and just plain “wrong” outcomes! So put the kids to bed and play Telestrations® After Dark, it’s “adult” mis-communication at its best! Draw what you see then guess what you saw for hilarious, weird, irresponsible, laugh-out-loud mis-communication! 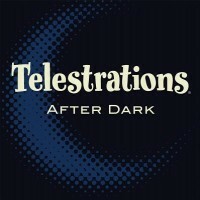 Add a Review for "Telestrations After Dark"